I received some positive feedback on my Design Lessons at Comic Book Camp post, so I though I’d share another lesson from comics camp. Today’s lesson is about one of the most valuable, yet underutilized tools in the cartoonist’s metaphorical toolbox: page composition. No amount of impressive draftsmanship can hide poor page architecture. Let’s break the comic page down into basic elements, and label each part, and learn how they work. This will also sound very basic, don’t be fooled! 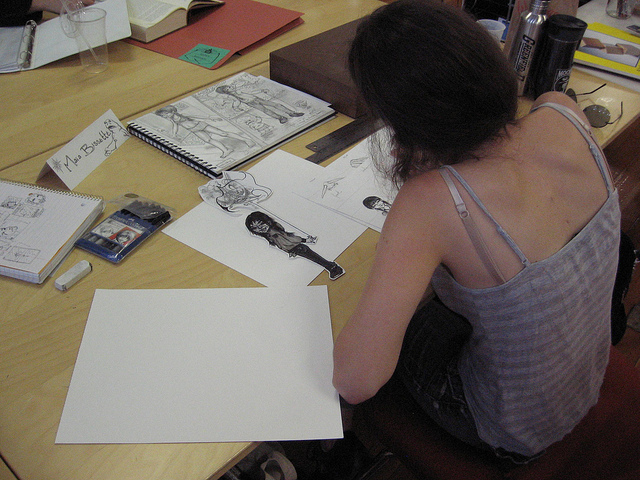 even master cartoonist must keep these basic concepts in mind when crafting a page. For an example of effective page composition, I offer this page from one of my favorite short comics, “Flies on the Ceiling” by Jaime Hernandez. 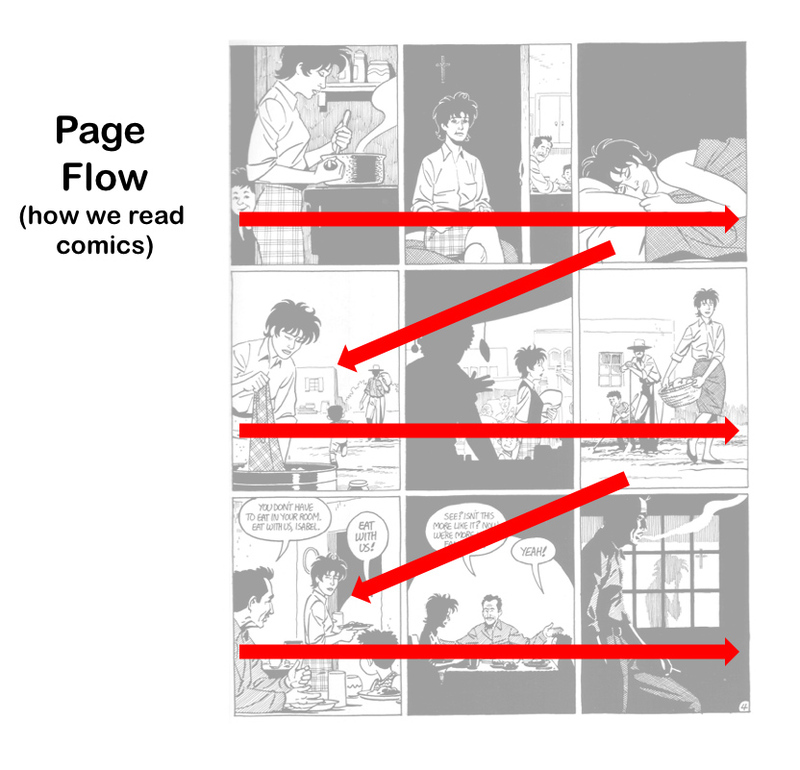 The first thing we need to consider when building a page of comics is page flow, or how we read comics. In this culture, we read them left to right and top to bottom. Cartoonists always need to keep this knowledge at the front of their brain. It will affect how every panel is drawn. As a general rule, we always want to “go with the flow”. We want to design our pages to lead the reader’s eye in the direction it wants to go. You’ll notice that in each panel our protagonist, Izzie, is pointed in the direction of page flow. This is not an accident, Jaime Hernandez designed these panels to lead your eyes. I like to say that panel design sends secret messages to your brain telling it “look here”. If panel composition goes against page flow, it can jar the reading experience. And sometimes you want that–perhaps you want to stop the reader in their tracks. This is a good time to break the “go with the flow” rule. Next, let’s look at the most basic element of the comics page: the panel. If we compare comics to prose, I like to think of a panel as a sentence. A horizontal row of panels is called a tier. I like to think of the tier as a paragraph. Like a paragraph, it is a unifying element. The start a new paragraph is the start of new idea, it signals change. A new tier is also great opportunity to signal change. 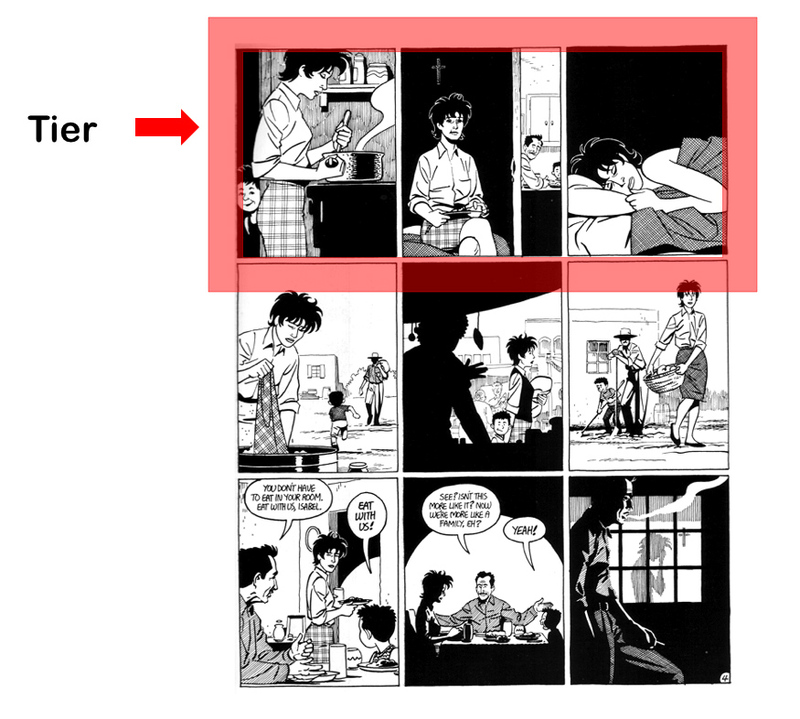 You’ll notice that on this page the two major changes in time and location were made at a tier break (panel 4 and panel 7). What happens when he alters this story slightly, like this? There are two extra beats before the guy responds “I guess”. Panel repetition is a simple way to stretch time. “Flies on The Ceiling” is an interesting specimen, because Jaime is using a perfect grid. 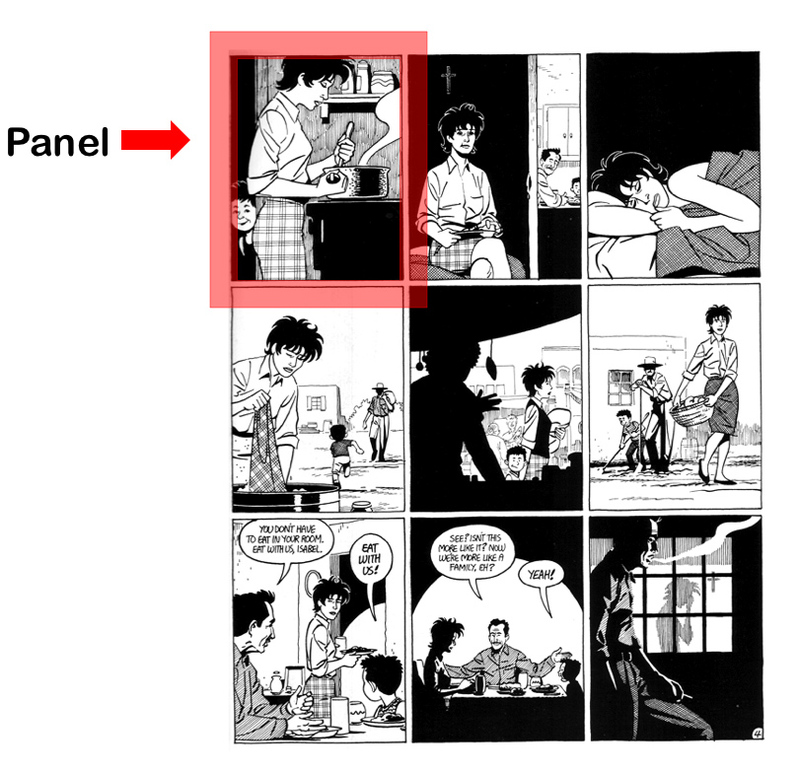 Every panel is exactly the same size, as in the above McCloud example. What happens if we play with panel size? How does that sequence compare to this one? Time is stretched, but in a different way. The meaning is for us, the reader, to determine. I interpret it as a pregnant pause–there is something going on here beneath the surface. Playing with panel size is a good ways to give a certain moment significance. It’s sending another secret messages to the brain of your reader: “Look here”. A big panel equals a big moment. There’s so much to consider when building a page of comics! How do you plan out the perfect design? When you build a house, you need a blueprint. In comics, we call those blueprint thumbnails. 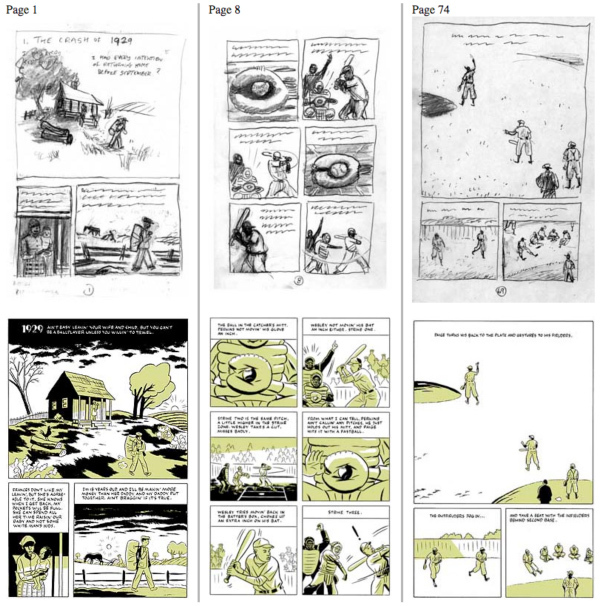 Above are the thumbnails and finished art for Satchel Page: Striking Out Jim Crow by James Sturm and Rich Tommaso. You’ll see that thumbnails are a rough preliminary sketch. It’s not about creating artwork, it’s about recording information. Creating a good page of comics, and then a good sequence of pages, is a bit like solving a puzzle. Thumbnails let you problem solve on paper before you commit to finished artwork. Don’t be to precious or careful about it, just scribble till you have a plan that works. You’re comics pages are sure to benefit from it.